He said that if Dhumal's name as the party's chief ministerial face had been declared the day the list of candidates was announced in Delhi. 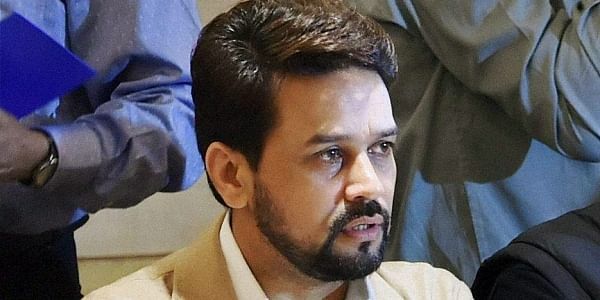 SHIMLA: Having settled the issue in his family's favour, Bharatiya Janata Party (BJP) MP Anurag Thakur now says declaring his father Prem Kumar Dhumal as the chief ministerial face in Himachal Pradesh has cleared all "confusion" and has swung the voters in the party's favour in the assembly elections. Against the backdrop of widespread speculation that the party had toyed with the idea of projecting Union Minister J.P. Nadda as its chief ministerial candidate, Thakur, Dhumal's son, claimed that his father's name had been agreed upon well in advance of the November 9 Himachal assembly voting. "There was confusion among the cadre and voters as to who would lead BJP because various stories appeared in the media. Names of those not even in the race had cropped up. By declaring a CM face, the party leadership has cleared the confusion," Thakur told IANS in an interview. He said after the announcement the mood in the party had changed and had also charged up the workers. "Now they are vocal and are more enthused and energised after the announcement of Dhumalji as the CM face. We can see a swing in the public mood. From here... the stage has been set for the duo of Modiji and Dhumalji. "In the coming days the Prime Minister is going to address seven rallies. These rallies will change the entire scenario in favour of the BJP. The way Dhumal's name was announced by Amit Shah, it has sent a very strong message to voters and the cadres," he said. He said that if Dhumal's name as the party's chief ministerial face had been declared the day the list of candidates was announced in Delhi, the impact would not have been as powerful as it was now. "The hype, which we have built up today, would not have been built if his name as CM face had been announced earlier. Amit Shah strategised it well. Now, from here, we will only increase our numbers. The day and timing of the announcement was superb," he said. Asked about the delay in the announcement, which had set political tongues wagging, Thakur said, "Nothing happens in the BJP without planning and strategy when leaders like Modiji and Amit Shah are involved. It was planned." The MP from Hamirpur also hit out at the Congress leadership and questioned Rahul Gandhi's abilities, saying he lacked the guts to be a powerful and decisive leader. "The Congress and its leader have no guts. They bowed before Virbhadra Singh, who is on bail. They can't even get rid of Singh in a small state like Himachal Pradesh. We have examples of dissent in the Congress after Ashok Chowdhry was removed as the state chief. How can he (Gandhi) run a country when he is not able to run his own party and control his own leaders?" Thakur wondered. Asked about reports of a sudden surge in Gandhi's popularity, Thakur countered that if he is as popular as is being claimed by the Congress, why has the party refrained from fielding him at more public meetings in Himachal Pradesh. "Why have Congress leaders in Himachal Pradesh not requested Rahul to address more rallies? Even the Congress in states are not able to accept his leadership and you are talking about his popularity." Thakur said Gandhi also must understand that he can get to become the Congress President, but for the post of Prime Minister he would have to face the people as it is not "reserved". Talking about issues in the state, Thakur said corruption as well as law and order were big concerns and people of the state were fed up with the Congress. "There is mafia raj, goonda raj in the state. Virbhadra Singh has failed on every front. Unemployment is still a big issue. Over 900,000 youths are unemployed. The Congress has repeated many of the issues that were in their manifesto in the last election. Dev bhoomi (abode of gods) has been turned into an apradh (crime) bhoomi," he said. The state is already under a debt of Rs 50,000 crore, he claimed. Thakur said that if the BJP came to power, its focus would be on providing quality education to students with free laptops and tablets and 1 GB free internet data. "New tourist destinations will be developed. Water, forest and mountains will be used for taking tourism in the state in a new direction. Need bigger highways for better transportation. Apple industry will be linked to e-mandi. The state will be taken to newer heights of glory."